Useless /ˈyo͞osləs/: 1. having no ability – 2. not fulfilling intended purpose. Driven by popular hype, criticism, and capitalism, we often begin with cliched understandings of emerging technological mediums. As we begin to learn more about Artificial Intelligence and work to advance the field, we must see beyond these contrived ideals in order to design alternative propositions for the very real humans and machines. The Useless A.I. Symposium explores the complex challenges of contemporary design within the field of Artificial Intelligence and Machine Learning. 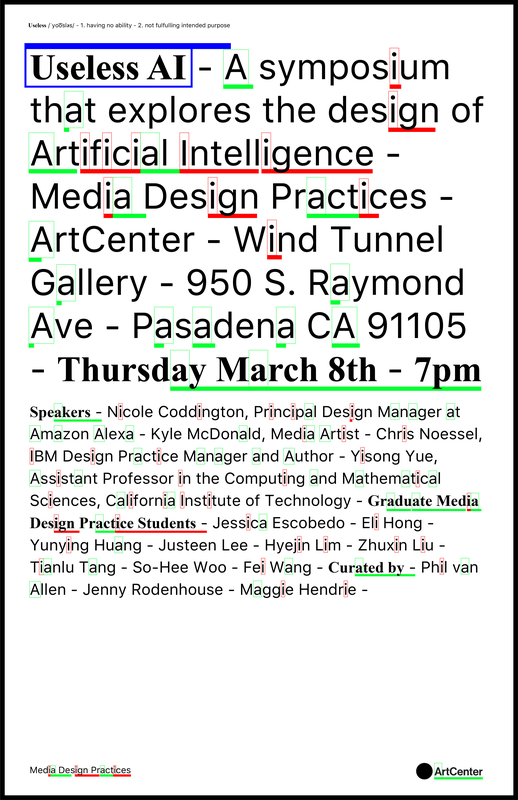 The event brings together guest speakers – Nicole Coddington, Principal Design Manager at Amazon, Alexa; Kyle McDonald, Media Artist; Chris Noessel, IBM Design Practice Manager and Author; Yisong Yue, Assistant professor in the Computing and Mathematical Sciences, California Institute of Technology – to confront Artificial Intelligent stereotypes and explore the true usefulness of the machine and what it can be used for. The guest speakers will be joined by Media Design Practice graduate students who will interpret the brief of “Useless A.I.”, sharing their critical, humorous, and risky design investigations.